On Elementary Season 5 Episode 25, Holmes and Watson investigate a murder that started a gang war and find a familiar face on the season finale. On Elementary Season 5 Episode 24, Sherlock's behavior becomes erratic when he interacts with a mysterious woman, while a murder leads to a deadly gang. On Elementary Season 5 Episode 23, Holmes and Watson zero in on another competitor as a suspect when a reality show contestant is murdered. "Fly into a Rage, Make a Bad Landing"
On Elementary Season 5 Episode 22, Holmes and Watson investigate when Detective Bell's girlfriend is assaulted and her ex-husband is killed. "The Art of Sleights and Deception"
On Elementary Season 5 Episode 20, Holmes and Watson investigate the murder of a man Sherlock believed to be one of New York's worst private investigators. On Elementary Season 5 Episode 19, during a case, Sherlock and Joan search for a treasure map said to lead to a fortune in gold hidden in New York City. 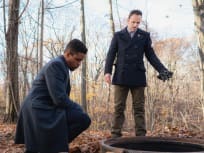 "The Ballad of Lady Frances"
On Elementary Season 5 Episode 18, the police call in Holmes and Watson when a crime is only heard through cutting edge gunshot detection system. 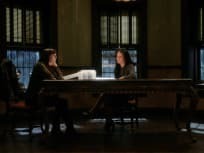 On Elementary Season 5 Episode 17, Sherlock and Kitty's relationship becomes strained, and Joan tries to prove a string of murders is connected to an old case. 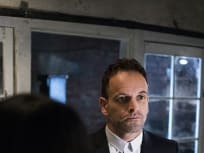 "Wrong Side of the Road"
On Elementary Season 5 Episode 16, Kitty Winter, returns to warn Holmes that a killer is eliminating everyone involved with a case they worked on in London. On Elementary Season 5 Episode 15, Holmes and Watson investigate an eSports video game player who is attacked in front of his fans during a live video stream. On Elementary Season 5 Episode 14, a man holds Joan hostage threatening to kill her unless Holmes finds the person responsible for the death of his son. On Elementary Season 5 Episode 13, Holmes and Watson uncover a connection between the murder of a clown and the creation of a new weaponized virus. On Elementary Season 5 Episode 12, a kidnapper who has been holding a woman for years, goes to extremes to avoid being caught by Holmes and Watson. 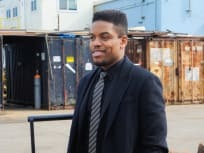 On Elementary Season 5 Episode 10, when someone uses her medical license to sell drugs, Watson is implicated in a DEA investigation of illegal prescriptions. 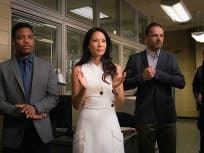 "It Serves You Right to Suffer"
On Elementary Season 5 Episode 9, Holmes and Watson have just three days to find the real murderer when Shinwell is accused of a gang killing. "How the Sausage Is Made"
On Elementary Season 5 Episode 8, when Joan learns that Sherock has been lying to her about attening recovery meetings, she worries about his sobriety. On Elementary Season 5 Episode 7, when a base jumper is shot out of the sky, Holmes and Watson must unexpectedly search for not one but two murderers. On Elementary Season 5 Episode 6, when a chef and his patrons are poisoned after dining on a tasting menu, Holmes and Watson investigate their mass murder. 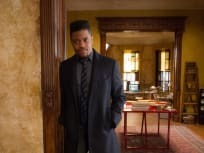 "To Catch a Predator Predator"
On Elementary Season 5 Episode 5, Holmes and Watson investigate the murder of a man who outed sexual predators on dating sites and publicly shamed them. "Henny Penny the Sky Is Falling"
"Render, and Then Seize Her"
On Elementary Season 5 Episode 3, Capt. 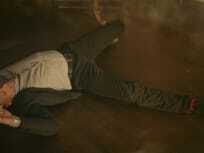 Gregson's girlfriend hires Holmes when she wants an investigation to take place off of Gregson's radar. On Elementary Season 5 Episode 2, Holmes and Watson get caught up in an international search to recover a centuries old, priceless artifact. 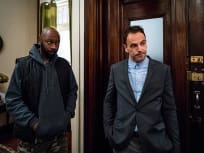 On Elementary Season 5 Episode 1, Holmes and Watson join the NYPD in the search for a serial bomber who has been in hiding for the last six years.